Who Won Dancing with the Stars Fall 2018? 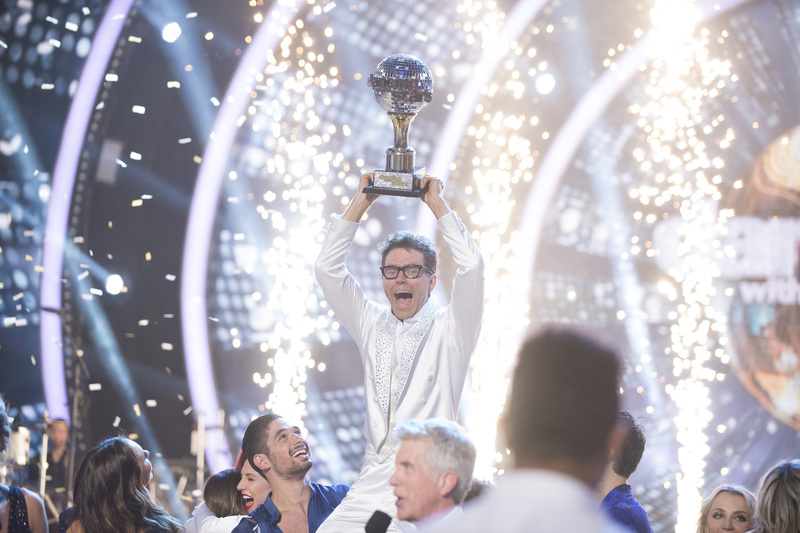 The Season 27 winner Bobby Bones and his pro partner Sharna Burgess have just been awarded the Mirrorball Trophy for the Fall 2018 season of Dancing with the Stars! The always-exciting duo were fan favorites throughout the season, adding a lot of humor and fun to their routines, and during the Dancing with the Stars finale they edged out their fellow competitors, Alexis Ren and Alan Bersten, Evanna Lynch and Keo Motsepe, and Milo Manheim and Witney Carson. Read our DWTS Finale 2018 Recap for full details on the Season 27 Dancing with the Stars finale, and read on below to celebrate Bobby and Sharna's journey to the Mirrorball Trophy! His final dance of the season was a larger-than-life Freestyle that cheekily acknowledged that his showmanship outpaced his finesse, and the judges loved it so much they awarded him a perfect 30 out of 30, saying the dance perfectly summarized what was so enjoyable about Bobby and Sharna's routines. In the end, his infectious charm and improved dance moves were enough to win him the trophy. Congrats on the championship, Bobby Bones!